FreshDirect is fast becoming a leading player in the rapidly expanding online grocery ordering market, where they make shopping and delivery fast and easy with high quality food and meals, plus supermarket brand favorites. This success, however, has not come without its challenges. Among the most critical the company faced was a flooring solution for 15,500 square feet at their newest building on 52nd street in Manhattan, where food products are warehoused. Having previously experienced a flooring failure at its Long Island City location only six months after installation, FreshDirect contacted The Gillespie Group, a NJ-based commercial flooring company. It was through their comprehensive assessment and suggested remedy of the problem that FreshDirect was motivated to contract The Gillespie Group to assess, recommend and install the flooring for their New York City location. 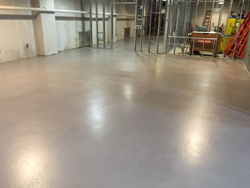 Mike Tuzel, LEED AP, Project Manager – Facility Design & Development, FreshDirect needed to resolve a number of flooring issues that plagued the Manhattan facility, including a mix of concrete and plywood flooring substrates that varied throughout each level. FreshDirect wanted the new surface to be seamless and easy-to-clean as well as durable and slip-resistant; and it didn't want to worry about leaks or spillage seeping through to the level below. Because of the project’s considerable size, they also needed a cost-effective solution. The Company chose PIP’s Protect UC-RP, a self-priming, three or four (with colorpack) component, slurry grade, Rapid Placement Heavy Duty Urethane Concrete Mortar. Protect UC-RP is formulated specifically for ease of placement and leveling properties, while maintaining the durability required for demanding environments. Protect UC-RP is typically installed at 3/16” to 1/4” thickness, and has tensile strength that is conducive to a plywood surface. Installation over plywood was required for FreshDirect’s offices—and UC-RP retains its flexibility and does not crack when the plywood contracts. Scheduling and weather conditions made upfront planning a critical factor in the FreshDirect project’s success. Summer heat proved to be the biggest challenge that The Gillespie Group overcame during the installation. Temperatures reached into the 90s and no climate control was available. A second challenge involved a section of the basement level that was owned by another company. The Gillespie Group had to ensure any installation odors would not enter the space during the project. Finally, there was also the issue of working in proximity with other contractors, in the same space, at the same time. The Gillespie Group partnered with PIP technicians to develop a system for FreshDirect that was not only durable and seamless, but highly functional and moisture resistant at the same time to address the fact that various areas would be somewhat wet. They completed the entire installation with PIP product; 8,500 square feet of PIP on second floor; 7,000 of PIP installed on the basement level. The project was completed within the aggressive six-week timeframe and was met with an extremely pleased and appreciative reception from FreshDirect’s management and staff. Finished in late August, the results impressed the FreshDirect executives that in December The Gillespie Group was awarded the million-dollar flooring contract for FreshDirect’s new facility in the Bronx. The Gillespie Group, with headquarters in Dayton, NJ, has been a family-owned New Jersey-based business since it was founded in 1985. A leading nationwide commercial flooring and carpet company, The Gillespie Group offers a unique combination of consultation, product knowledge, industry experience, technical expertise, responsive service, and proven reliability. All company representatives have a deep knowledge of carpet and flooring materials and their performance characteristics. The company offers one of the strongest carpet warranties in the industry. The Gillespie Group team of expert technicians and installers are trained and certified by major manufacturers to ensure the highest quality workmanship. For more information on The Gillespie Group, please visit: http://www.thegillespiegroup.com.